Rochester Institute of Technology students develop open source community projects as election results come in. 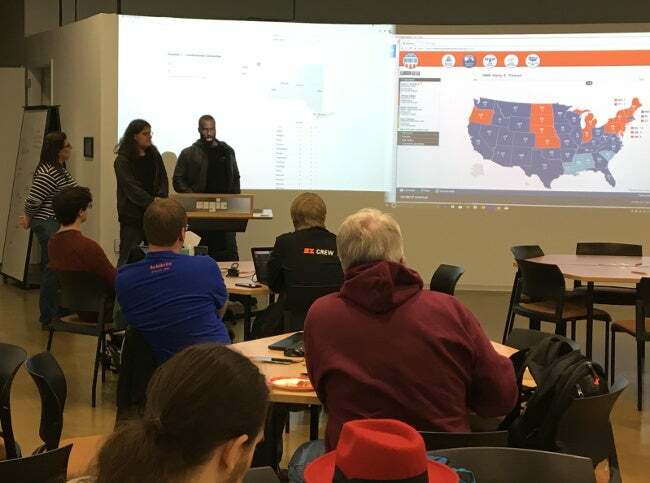 On November 7, 2017, members of the Rochester Institute of Technology (RIT) community came together for the annual Election Night Hackathon held in the Simone Center for Student Innovation. This marked the seventh anniversary of a civic tradition for the FOSS @ MAGIC community, in which students and faculty analyze civic problems in the local community, state, or country and propose a project to address them. MAGIC Center faculty and event organizers are on hand to help students choose open source licenses and publish and share their code. 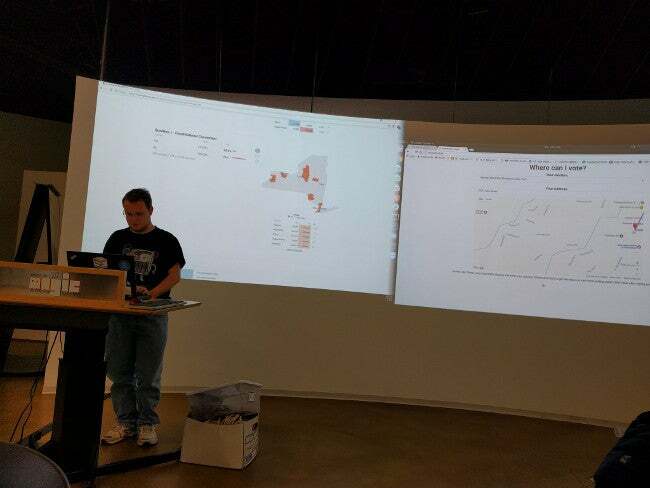 As local and state election results come in and are displayed across nine projectors, participants work on their projects using open APIs compiled by Dan Schneiderman, FOSS @ MAGIC community liaison, for public data sets made available by federal, state, and local governments. Local Rochester coverage is enhanced, since Monroe County is one of three counties in New York that releases public data for election coverage. Some participants used data from Henrietta, N.Y., where RIT is located, for their projects. To get participants excited about creating their projects, Second Avenue Learning, an educational game company in Rochester, demonstrated its Voter's Ed app that replays historic elections, keeps voters up-to-date on current ones, and lets people simulate elections using open data and HTML. It also allows users to examine key issues and hot topics related to national events. The company, represented by founder Victoria Van Voorhis and two employees (one an RIT alum), held a design discussion with students and the community for new features to prototype. RIT faculty Sean Sutton and Paul Ferber provided subject-matter expertise to the application. Additionally, Pratik Shirish Kulkarni, a second-year computer science major from Mumbai, India, presented the status of his FOSS @ MAGIC LibreCorps internship. LibreCorps placed Pratik with UNICEF Innovation in Manhattan, where he worked on MagicBox, a set of big data APIs and technologies used to chart Zika outbreaks and connectivity across schools in Africa. Pratik demoed some of his UNICEF-funded work, which he is continuing part time on campus. During the election night hackathon, third-year student Chris Bitler created a tool to make it easier to get to the polls to cast a vote. His Where Can I Vote? web application provides directions from an address to the closest polling location. It uses the Google Civic Information API to find election data and calculate a specific address' voting district and candidates. Chris was searching for project ideas at the beginning of the hackathon, but quickly found the civic data API returned interesting data about polling locations. "After seeing that, I gave some thought to how some people don't know their polling location and how a simple website could be useful," Chris says. His project was motivated by simplicity, as he wanted to create something anyone could navigate without being lost in information. Chris open sourced his project on GitHub under the MIT License. Another project focused on tracking local election data in New York's Chautauqua, Monroe, and Suffolk counties. RIT and FOSS @ MAGIC alumnus Nathaniel Case continued work on his monroe-elections web application, which displays data from all races in the three counties in a quick and easy-to-read format. During the hackathon, his web application updated in real-time as results from the local elections, including referendums and other non-partisan elections came in. Nathaniel open sourced his project on GitHub under both the DBAD and GPLv3 licenses. You can learn more about the FOSS @ MAGIC initiative, including upcoming events, on its website or by signing up for its mailing list.